The Daikin RZAG50A - R32 refrigerant outdoor unit rated at 5kw output can have a number of different styles of indoor units fitted to it and can provide both air conditioning and heating year round. The main advantage of using the Daikin RZAG50A outdoor unit is that it offers much longer pipe distances (up to 50 metres from indoor to outdoor unit) compared to other air conditioning and heat pump systems. This makes these systems ideally suited for light commercial business premises where the outdoor unit location has to be fitted in a maintenance service area away far away from the indoor unit location. 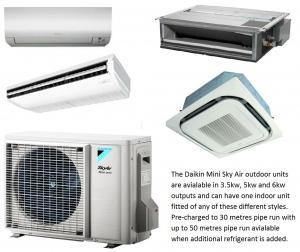 See full details of the Daikin RZAG50A air conditioner - heat pump in the brochure below.